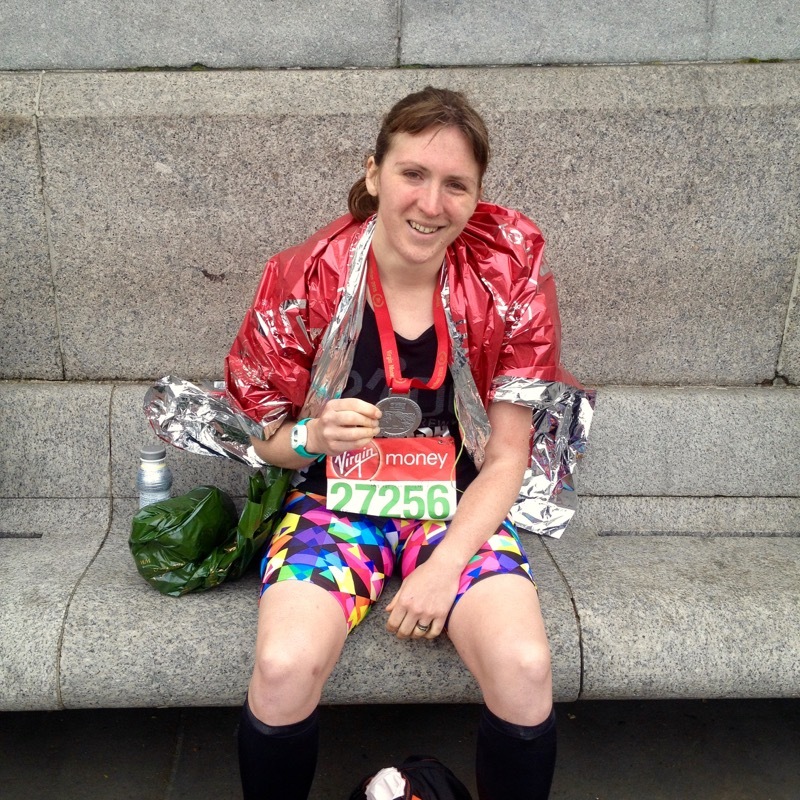 This was my 5th marathon, and my second time running London. 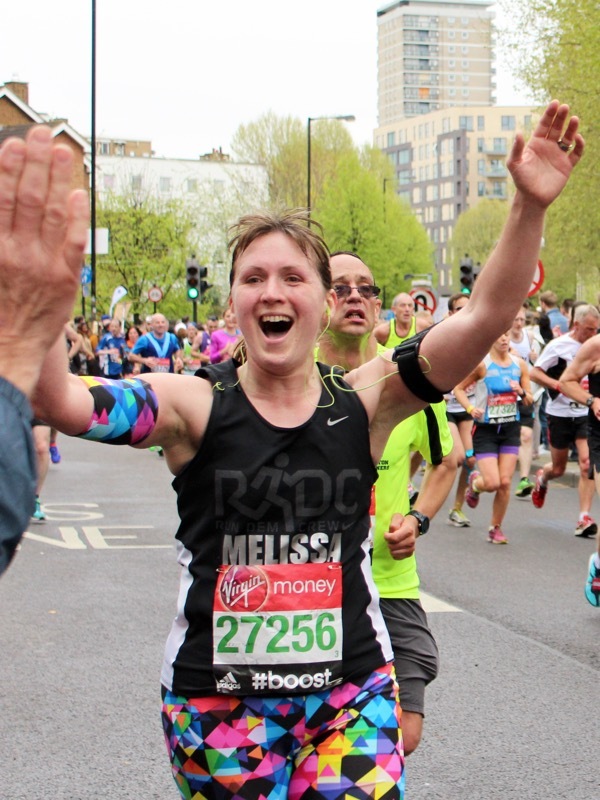 I’ve always said that I learn so much from every single marathon I run, and this time in particular, I was really trying to apply the lessons learnt from last year’s London marathon (namely – do NOT set off too fast, even if you feel good! ), and Berlin marathon (sticking to a pacing plan can make a world of difference in a race). So with those two lessons firmly in mind, the first half was always going to be crucial for me in terms of reigning my speed in and running it as relaxed as humanly possible. I kept repeating to myself to expend as little energy as possible until at least halfway. 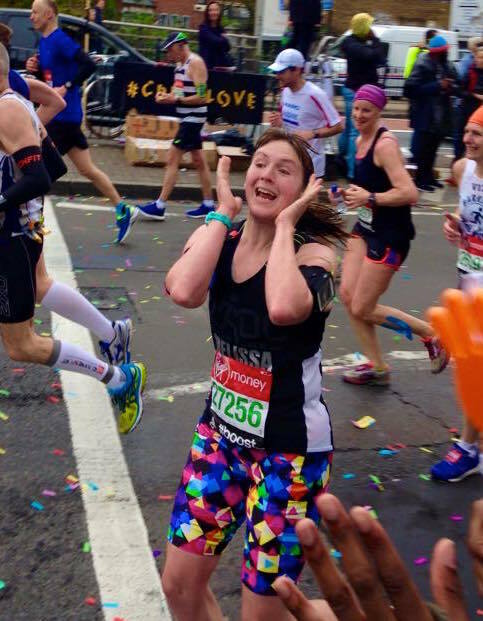 The first few miles were spent enjoying the moments, making memories, running into friends (and seeing Marathon Talk‘s own Tony’s Trials for the second year in a row! ), and being surprised by friends cheering at points along the route (shout-out to Dommy, Linda, Stephanie, Sarah, Cat, and Simon!). In general, I find the first half of the course (bar the Cutty Sark) to be incredibly dull. I know the area between Miles 6-12 particularly well, but it still doesn’t make them any more interesting! At least this year we were blessed with my perfect race weather – cold, cloudy, and slightly damp – so south London wasn’t the baking hot, shade-free torture zone it was last year. As always, my first major highlight was passing home at Mile 12, where all the neighbours came down to the end of the road to cheer me on. I grabbed a quick kiss from my husband, waved hello to the in-laws and a surprise friend from out of town(! ), and applied a bit of Body Glide to prevent further chafing from my me-made sports bra neckline (never a problem before this race, and the Body Glide stopped anything from developing further). My husband said afterwards how much fresher I looked this year, and I definitely felt that, too. Running past home at Mile 12, very happy to see my husband, neighbours, and family! In terms of my goals, the first half was hugely successful – I ran it relaxed, easy, and averaged only about 10 seconds under my goal pace of 5min/km (8min/mi). For me, mentally, however, the race only really starts to get fun once I pass Tower Bridge and the halfway point – I much prefer the course north of the river for some reason, even though many hate the desolate Isle of Dogs. Last year, I utterly hated the London crowds. It felt like 3 1/2 hours of people shouting at me, at a constant din turned up to 11, with no respite from the heat, crowds, and shouting. This year, I definitely noticed more patches where the support was quiet (maybe due to the less-nice spectating weather?) and I made a point to appreciate those when they came. Psychologically, I dealt much better with the crowds this year than before. A little after halfway, I noticed my left hip started to ache, and then occasionally give me sharper points of pain, but this is something I’ve become accustomed to in road marathons – running for such a distance on the hard surfaces really does a number on my hips in particular (I imagine that running the same distance on soft trails wouldn’t, though I’ve yet to test that theory). Since this was a pain I’ve had before, I didn’t panic, but instead reminded myself that “it’s a marathon – it’s supposed to hurt” and concentrated on improving my form. This is the first I’ve really tried this technique, but I was very impressed – when I made the mental note to pick up my heels, land on my forefeet, and pull my shoulders back, it was like I’d popped a painkiller. So I kept reminding myself of this as much as possible, and I credit it with my finishing the race with only two blisters and a bit of stiffness in my legs and shoulders. So by the time I went through Canary Wharf at 30km I was feeling a bit ragged, but still not too bad – not as relaxed as the first half, but nowhere near as broken as last year! From Canary Wharf, I pretty much just counted the miles til I got to Mile 21, where my crew was waiting for me. They’d put up signs all along the course the night before the marathon, and I honestly got a boost every time I saw one – I even gave our gunfinger salute to quite a few! But even experiencing the hallucinogenic high of Mile 21 last year didn’t diminish the impact of it all over again this year. 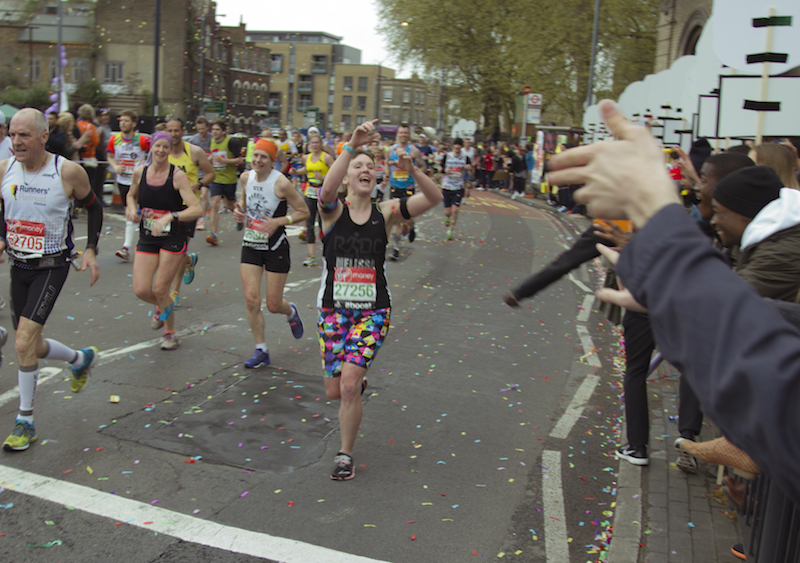 To see hundreds of familiar faces all cheering you on, shouting for YOU, getting so excited that you’re some celebrity runner, seeing your face blown up to a billboard size, then shouting and cheering back at them all while a confetti cannon bursts overhead… just epic! (Though I don’t recommend open-mouthed cheers while confetti is falling, hahah!). 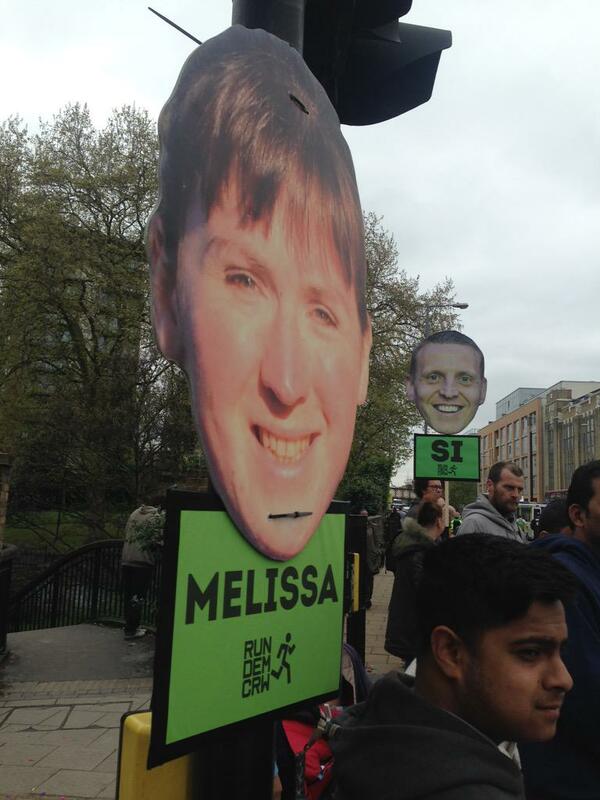 Just after we passed Mile 21, another runner commented to her friend “Now that’s what I call support!”. Then I had to concentrate on not getting too excited since I still had 5 miles to run, but I knew that once I hit the Highway again it’s a straight shot all the way to Big Ben, which is mentally so much easier to handle. It may be 5 miles, but it’s a straight 5 miles! I had to really work to keep up the pace here – I kept targeting 5min/km but I’d look at my Garmin and see 5:10, or 5:15, and have to really struggle to pick up my legs to bring it back down to 5:00. I walked through two water stations to better get my last salt cap and gel down, but I honestly don’t think it added much to my time (I’d walked through all the Berlin water stops, afterall). I’d really wanted to burst through the last 5km like we had in Berlin, but couldn’t really get my speed up any faster, so the brilliant feeling of passing everyone at the end just wasn’t meant to be (I passed more people than passed me, according to the official stats, anyway!). I worked really hard to maintain my goal pace, though, and even though my second half was slower than the first, the stats had my average pace at 5:02/km, which is incredible! The Embankment was a sheer wall of noise (turned up to 11) and pushing past with everything I had, I only really focused on counting down the bridges and keeping my eyes on Big Ben in the distance. Having run the course before, I knew St James’ Park feels deceptively long – after you turn the corner at Big Ben, it’s still one long mile left to go. But before I knew it, I was on the red road outside Buckingham Palace and stumbling over the finish line! I followed my fellow race zombies to collect my baggage, then my husband, his parents, and our friend, though I had to sit down for some “quiet time” before I could move anywhere or do anything (I get this after every marathon). I’m really proud of myself for sticking to my pace plan and taking it easy for the first half – I found it much more enjoyable than last year, and even though it was still a tough race, I was able to let my cheering crews lift me up. My finish time was only 2 minutes slower than last year, but it was a world of difference in terms of experience, pacing, and control. Oh, and I got a lot of compliments on my me-made running shorts from the crowd and other runners alike, too! I am so proud of my special niece! I dream of doing that, but my back says no when I’m on my feet longer than 5 minutes! I love you shorts and was going to ask you if you made them. Keep up the good work, Lissa. Love you! I really like the big cable tie through your chin, and I’m disappointed you don’t have the piercings to match…. LOL! That really is incredible support, what an amazing crew. I was following your progress online from just before the halfway mark. Absolutely brilliant running, awesome pace. 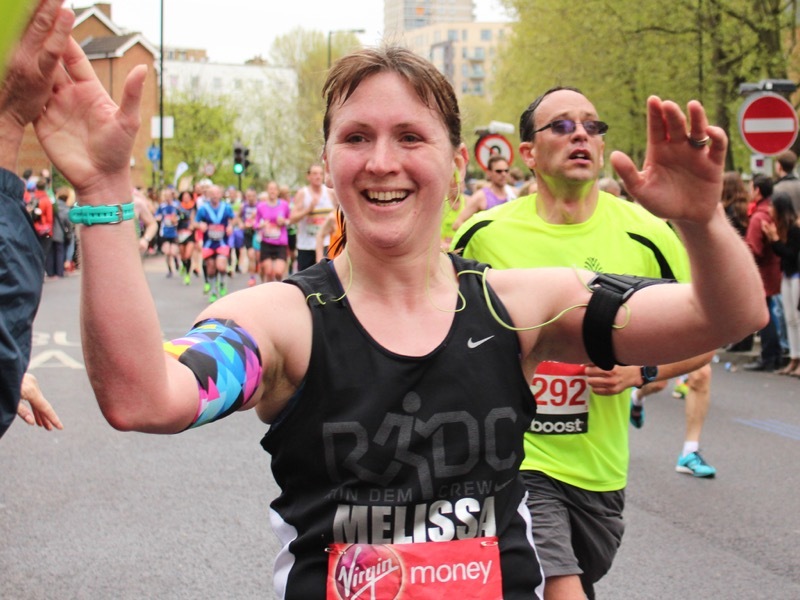 Great effort Melissa, enjoy your recovery time! 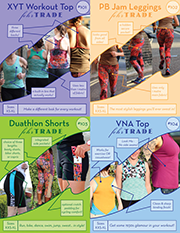 I just checked your sewing blog to see how you went in the London marathon and discovered you had a running blog yay ! I look forward to exploring it more later on, but I have to get going to Rotorua where I am running my first marathon tomorrow! So your ‘don’t go out too fast’ advice is timely for me – you can never be told that too often. 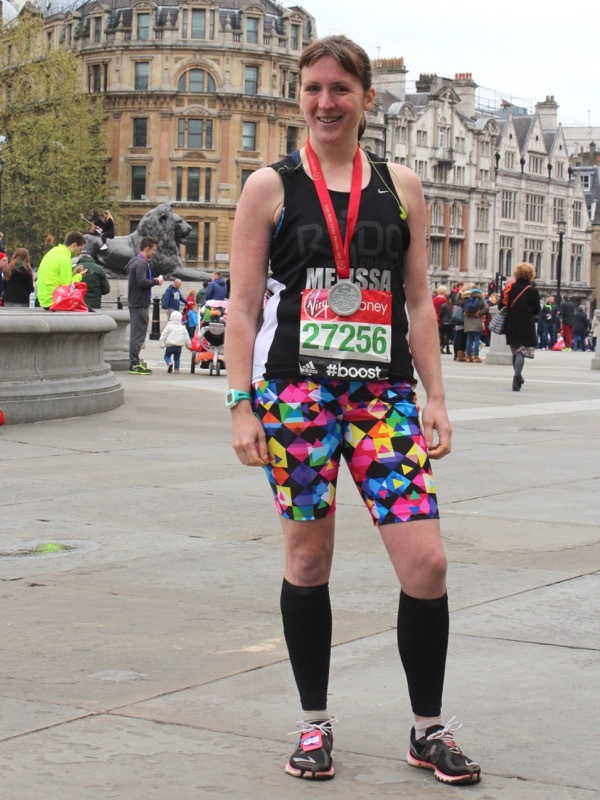 Well done on your result and BQ speedy legs, you have some awesome photos – and love the shorts!